If you drive a Nissan Leaf, you already don’t have to worry about paying for gas, which is hovering near $4 per gallon in much of the U.S.
Now, you don’t have to worry about paying for the electrons that fuel your car when you’re out on the road either. Nissan’s “No Charge to Charge” program is being significantly expanded, from about ten U.S. markets today to more than 25 by next June, with the possibility of more in the future. New Leaf buyers can join the program and get two free years of charging at any participating station, many of which will offer DC quick chargers. Even if most drivers don’t use a full charge for their electric vehicle on a daily basis, the availability of public charging access is a significant factor in consumers deciding to make the move to an all-electric vehicle. A study last year found that public charging is the least-frequent type of charging, but drivers want more of it if they're going to buy EVs. "The popularity of 'No Charge to Charge' since our April announcement shows that public charging spurs range confidence and additional LEAF sales," Brendan Jones, director of Nissan electric vehicle sales and infrastructure, said in a statement. No Charge to Charge has been available in San Francisco, Sacramento, San Diego, Seattle, Portland, Nashville, Phoenix, Dallas-Ft. Worth, Houston and Washington, D.C. since earlier this year and will be expanded to at least fifteen more markets in the coming year, although specific locations were not announced. 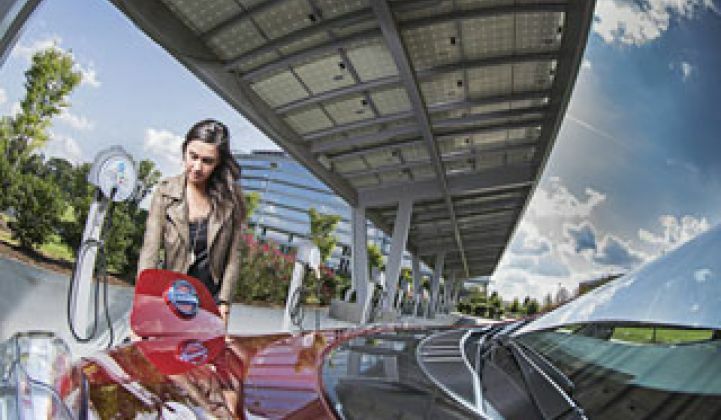 The program gives Leaf owners an EZ-Charge card, which provides access to Blink, CarCharging, AeroVironment, ChargePoint and NRG eVgo public chargers, as well as chargers at Nissan dealerships. The program leverages Recargo’s PlugShare app for customers to locate chargers included in the program. But not all chargers in the participating networks are part of the No Charge to Charge program. ChargePoint stations, for example, can be accessed and paid for using the EZ-Charge card, but are not part of the free program. The free program is also not unlimited. No Charge to Charge allows for up to 30 minutes at a fast-charging station and up to an hour at a level 2 station. Recargo has been trying to reduce the complexity of charging for drivers by providing information via the PlugShare app about the quality of chargers and trying to simplify pricing schemes, which vary widely. Of course, if potential EV drivers don’t have to think about the cost at all, and have access to various charging networks, that’s ideal. Even with the expanded Nissan program, costs for charging will vary for each station after the free charging time runs out. Some charge by the kilowatt-hour, while others charge on a per-session basis. Nissan would also like to see more pricing standardization in the near future. “The more complexity we reduce, the more sales we get,” Jones told AutoblogGreen. In response to the desire for more quick-charging stations, Nissan is installing 500 fast chargers at its dealerships and partner sites. Currently, DC fast chargers make up just a small fraction of the more than 12,000 public chargers in the U.S.
Nissan’s network of 500 fast chargers would rival Telsa’s Supercharger network, which plans for 200 quick charging stations by 2015. There are also reports from CleanTechnica that Nissan is in talks with Tesla about sharing its Supercharger technology. Nissan would not comment specifically on any negotiations with Tesla to Greentech Media, but issued this statement: "Nissan is committed to developing charging infrastructure readily available to EV drivers and is working with numerous partners across the world to do so. We welcome others joining in the effort as we believe universally compatible charging will further accelerate EV adoption."